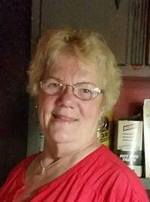 Martie A. Vogel Howell, 71, of New Martinsville, WV died in an automobile accident on Thursday, March 29, 2018 in New Martinsville, WV. Martie was born February 8, 1947 in Paden City, WV; daughter of the late Martin A. and Beatrice (Price) Vogel. She was the owner of the M&K Bar, clerk at the Save-a-Lot, graduate of Paden City High School, graduated from beauty school in Parkersburg, owned her own beauty salon in Paden City, involved with Paden City Alumni, Paden City Alumni Band. Member of American Legion Auxiliary Paden City Unit 86, Paden City Eagles, New Martinsville Moose #931, Duffy VFW and attended Paden City Christian Church. In addition to her parents, she was preceded in death by her husband, Willie Howell (2011); two sisters, Barbara Dragon and Sally Stewart; aunt, Peg and cousin, Sam and three special pets, Tess, Monica, and Peaches. Surviving are sister, Anna (Eric) Vogel-Richmond of Paden City, WV; three step-children, Charlie (Marcy) Howell of Parkersburg, WV, Angie Morgan and Kristy Kocher both of New Martinsville, WV; eight grandchildren; thirteen great grandchildren; special daughter, Sarah Hornbeck of New Martinsville, WV; canine, Angel and several nieces, nephews and cousins. Friends received 2-4 and 6-8 p.m., Wednesday, April 4, 2018 at the Jarvis-Williams Funeral Home, 1224 S Bridge St., New Martinsville, where service will be held 11 a.m., Thursday, April 5, 2018 with Pastor Cathy Harman officiating. American Legion Auxiliary Paden City Unit 86 will conduct an auxiliary service at 6:30 p.m., on Wednesday, April 4, 2018. Memorial contributions may be made, in Martie's name, to Jarvis-Williams Funeral Home, 1224 S Bridge St., New Martinsville, WV 26155 to help with the cost of the funeral. Interment to follow in Northview Cemetery in New Martinsville, WV. To send flowers to the family of Martie A. Howell (Vogel), please visit our Heartfelt Sympathies Store.